Ever wanted to remove yourself from the unmistakably drab discussion from the sea of reprobates that populate the inter-connected likes of Facebook or Twitter? Find yourself to be a connoiseur of a male? We may have the cure to an ailment you never knew you have. 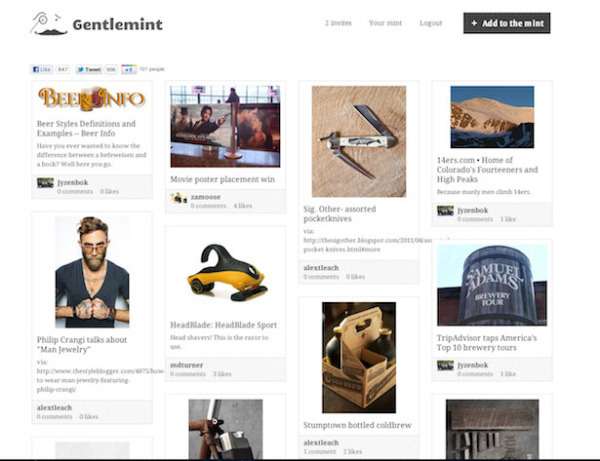 The fruit of two programmers' labours has produced Gentlemint: a social discovery site for the true gentlemen to peruse 'manly' content. Upon access, you're greeted with an interface that seems reminiscent of the Pinterest , just with the irrepressibly metaphorical scent of man. For founders Brian and Glen, this project started as a 12-hour momentary alternative to another project which they'd been working on for two years. A glass of bourbon and a half day later, the true gentlemen can now breathe a sigh of relief, knowing he now has a place on the internet to communicate and share with likeminded individuals. So far we've seen images of pure masculinity like World War 2 Navy Mines converted to furniture, a Grizzly Bear chair, a step-by-step guide to making an airsoft gun out of a soda bottle, and Abraham Lincoln carrying an assault rifle & The Declaration of Independence while riding a grizzly bear. Truly delectible to say the least.